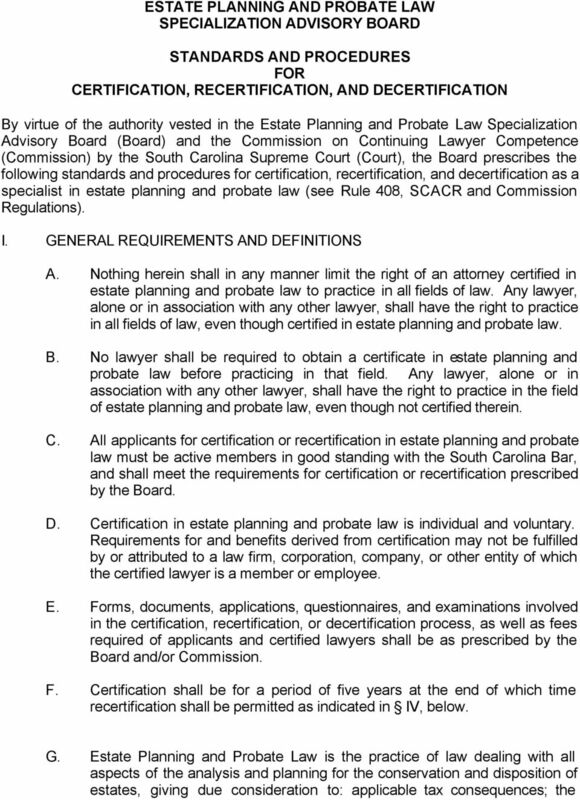 Download "ESTATE PLANNING AND PROBATE LAW SPECIALIZATION ADVISORY BOARD STANDARDS AND PROCEDURES FOR CERTIFICATION, RECERTIFICATION, AND DECERTIFICATION"
5 Service, South Carolina or other state taxing authorities, or the courts in connection with such tax returns and related tax controversies. C. CONTINUING LEGAL EDUCATION - MINIMUM REQUIREMENTS During each of the five (5) years preceding application, applicants must have earned credit for not less than twelve (12) hours of continuing legal education in approved courses or programs dealing with estate planning and probate law. For this purpose "approved courses or programs" shall mean courses/programs accredited by the Board for the estate planning and probate law specialty or courses/programs that would qualify for such accreditation. D. EXAMINATION Applicants for certification must pass an oral interview/examination and upon successful completion thereof, must take and pass a written examination to demonstrate sufficient knowledge, proficiency, and experience in estate planning and probate law to justify the representation of special competency to the legal profession and to the public. The written examination shall be administered only once during each calendar year, provided applications are pending, at a time and place to be determined by the Board, giving due consideration to the convenience of such applicants. E. FEES Applicants shall timely pay the fees established from time to time by the Board, including but not limited to application fees, filing fees, examination fees, and certification fees. 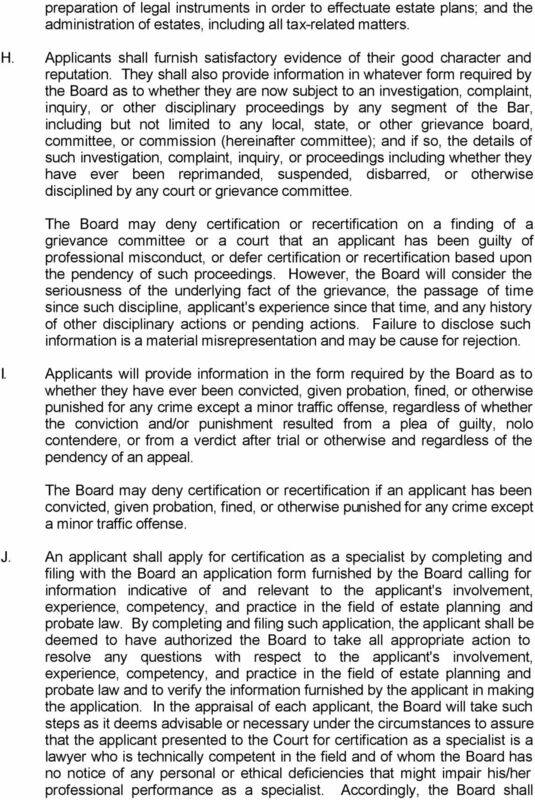 6 F. FAILURE TO FURNISH INFORMATION; MISREPRESENTATION Certification or recertification may be denied because of an applicant's failure to furnish requested information or because of misrepresentation of any material fact requested by the Board. III. REQUIREMENTS FOLLOWING CERTIFICATION A. During each annual reporting period all certified specialists in estate planning and probate law shall complete not less than fifteen (15) hours of approved specialty continuing legal education. "Approved specialty continuing legal education" means educational activities accredited by the Board for the specialty (see IV C which requires one hundred (100) hours of CLE credit for recertification). Provided, however, that for reporting period , a minimum of twelve (12) hours of approved specialty continuing legal education shall be required. B. A certified specialist must report annually to the Commission his/her compliance with III A and pay such filing fees, including late fees, as the Commission may from time to time prescribe. Failure to file and/or pay required fees may result in suspension from the practice of law in accordance with Commission Regulations. C. During the period of certification, all certified specialists must continue to practice law and to be substantially involved in the practice of estate planning and probate law (see II A & B, regarding the meaning of "practice of law" and "substantially involved in the practice of estate planning and probate law"). 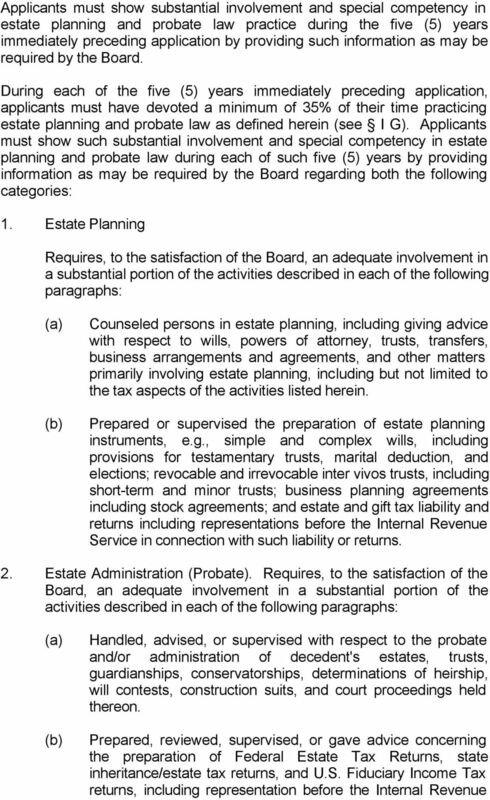 Should any certified specialist cease to practice law or to be substantially involved in the practice of estate planning and probate law, he/she shall promptly notify the Board for such action with respect to decertification as the Board shall deem to be appropriate. The failure of a certified specialist to notify the Board that he/she is no longer engaged in the practice of law or substantially involved in the practice of estate planning and probate law may constitute grounds for decertification of the individual concerned. IV. RECERTIFICATION A. Renewal of certification under the program shall be required every five (5) years. B. Applicants must demonstrate their continuing substantial involvement and special competency in the practice of estate planning and probate law as may be required by the Board. 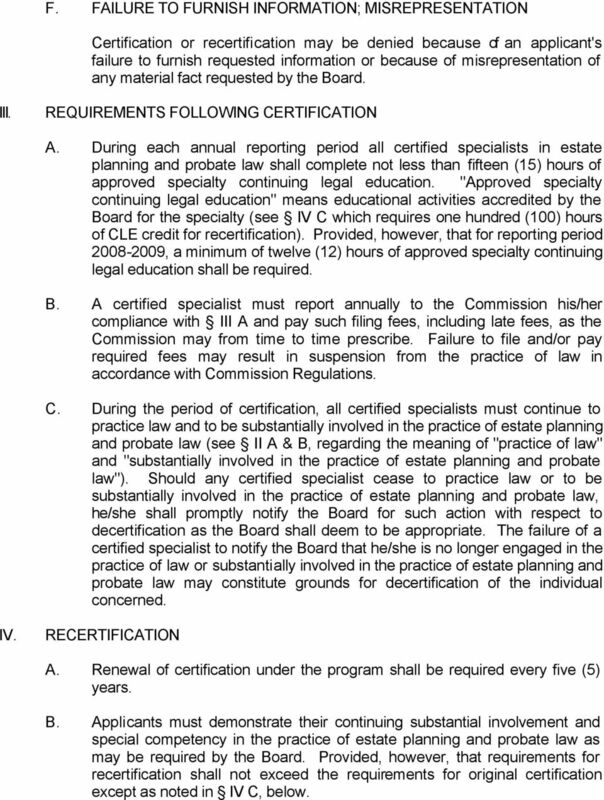 Provided, however, that requirements for recertification shall not exceed the requirements for original certification except as noted in IV C, below. 7 C. To qualify for recertification, applicants must demonstrate the completion of a minimum of one hundred (100) hours of approved specialty continuing legal education in the five (5) years since their original or latest certification. Provided, however, that for applications for recertification received prior to January 1, 2011, only ninety (90) hours of approved specialty continuing legal education shall be required. 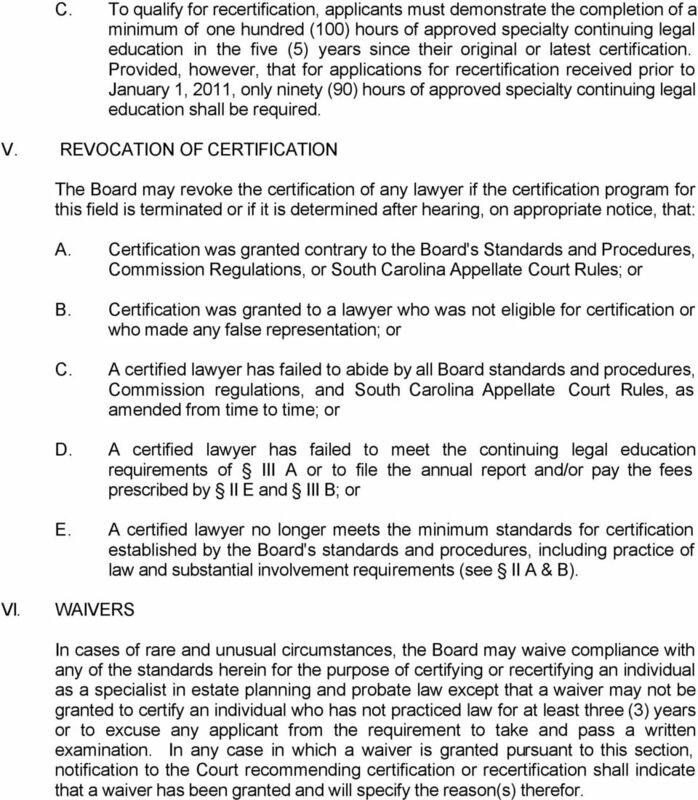 V. REVOCATION OF CERTIFICATION The Board may revoke the certification of any lawyer if the certification program for this field is terminated or if it is determined after hearing, on appropriate notice, that: A. Certification was granted contrary to the Board's Standards and Procedures, Commission Regulations, or South Carolina Appellate Court Rules; or B. 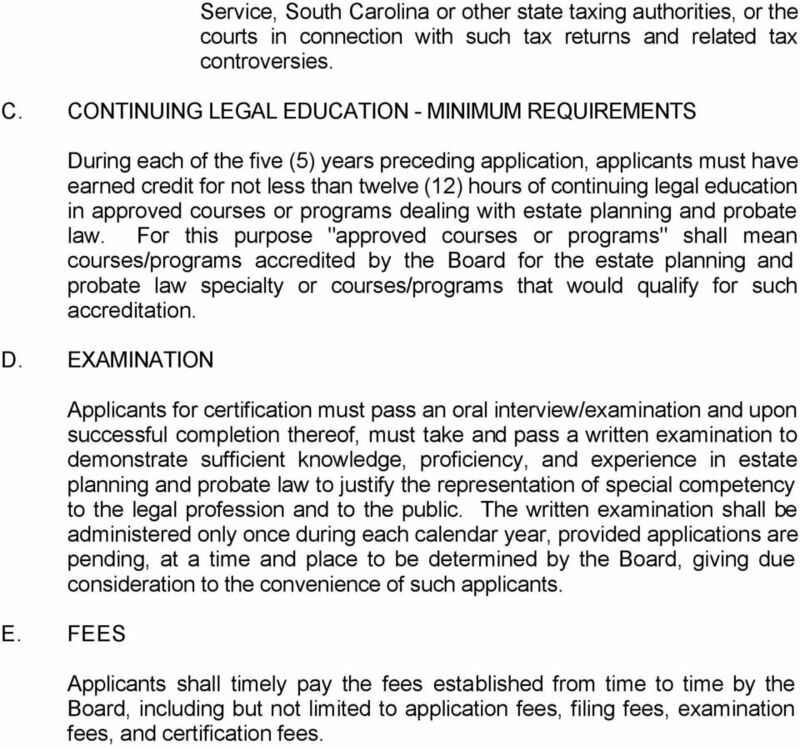 Certification was granted to a lawyer who was not eligible for certification or who made any false representation; or C. A certified lawyer has failed to abide by all Board standards and procedures, Commission regulations, and South Carolina Appellate Court Rules, as amended from time to time; or D. A certified lawyer has failed to meet the continuing legal education requirements of III A or to file the annual report and/or pay the fees prescribed by II E and III B; or E. A certified lawyer no longer meets the minimum standards for certification established by the Board's standards and procedures, including practice of law and substantial involvement requirements (see II A & B). VI. WAIVERS In cases of rare and unusual circumstances, the Board may waive compliance with any of the standards herein for the purpose of certifying or recertifying an individual as a specialist in estate planning and probate law except that a waiver may not be granted to certify an individual who has not practiced law for at least three (3) years or to excuse any applicant from the requirement to take and pass a written examination. In any case in which a waiver is granted pursuant to this section, notification to the Court recommending certification or recertification shall indicate that a waiver has been granted and will specify the reason(s) therefor. 8 VII. EFFECTIVE DATE These Standards and Procedures shall be effective October 31, 1990, or whenever approved by the South Carolina Supreme Court, whichever date is later, and supersede all prior Estate Planning and Probate Law Specialization Advisory Board Standards and Procedures for Certification, Recertification, and Decertification. 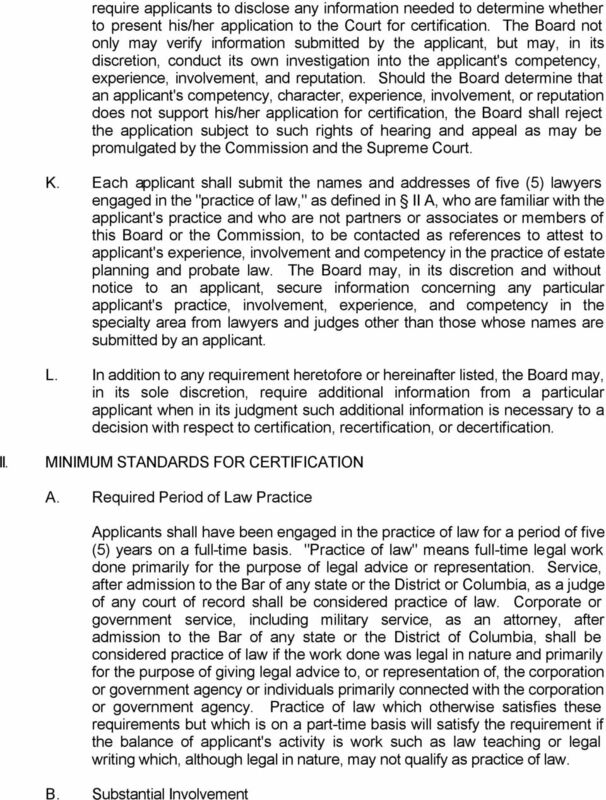 DEFINITIONS: TEXAS PLAN FOR RECOGNITION AND REGULATION OF PARALEGAL CERTIFICATION (As Amended June, 2012) TBLS refers to the Texas Board of Legal Specialization. SBOT refers to the State Bar of Texas. Your Hearing Network Application and Credentialing Agreement. SUBCHAPTER 7 MEDICATION ASSISTIVE PERSONS SECTION. SECTION. 17-87-701, Definitions 17-87-707. Disciplinary actions. 17-87-702. Certificate required. 17-87-708. Penalty. 17-87-703. Designated facilities.